West, a theoretical physicist and former president of the Santa Fe Institute, argues in this dense yet accessible work that there are simple laws that underlie all complex systems, whether organic entities or human constructs. Animals, plants, economies, cultures, cities, and companies are united by the fact that they come into existence, grow, mature, and decline. West’s central conceit in studying these phenomena is scaling: how a system changes when its size changes. He finds that the answer is not obvious, but it can be expressed mathematically. For example, doubling an animal’s size increases its energy requirements by only 75%, which remains true whether one looks at a mouse or a whale. 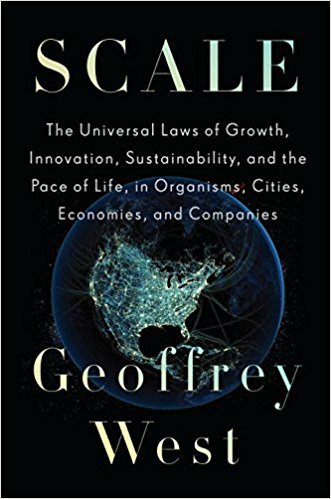 The structures of civilization scale similarly, West shows, as he analyzes cities and corporations within this framework. He supports his evidence with a plethora of striking charts and graphs that are notable for their simplicity. Reducing biological and cultural systems to quantifiable data streams has become fashionable, if rightly contentious, but West turns up many fascinating paradoxes in this large, stimulating, and mostly lucid book of Big Ideas.